If you compared Dolphin Nautilus Plus robotic pool cleaner to a car, then it would definitely be a Ferrari, whereas its predecessor would be something like a Ford Focus. This little robot will clean your pool within 2 hours, with its brush spins twice as fast when compared to other units, and will make sure your pool is always crystal clear and ready for swimming. This amazing gadget does exactly what it is meant to do; it cleans your entire swimming pool thoroughly, including all corners, floors, walls, and the water line. And, not only will it scrub, but also vacuum and filter everything it comes across, including large debris as well. This pool cleaner uses advanced technology and figures out the dimensions of your pool as soon as it is placed inside of it. Afterward, the device notifies the user what the best cleaning route would be. Dolphin Nautilus Plus comes with IntelliScan software; an advanced navigation system that allows this cleaner to scrub a pool’s floor and walls, regardless of their shape and size. Thanks to IntelliScan, this pool cleaner is able to identify the size of your pool. In addition, it automatically creates a cleaning plan that suits the user’s pool the best. This feature saves up a lot of time and labor and also offers maximum cleaning accuracy. Keep in mind that it takes this pool cleaner three cleaning cycles to learn its way around your pool. This cleaner is ideal for residential pools that are long up to 50 feet. However, if your pool has corners that join with the floor at a 90-degree angle, then the cleaner might have some trouble climbing the corners. In addition, this unit cannot climb nor clean pool steps. One of the reasons why Dolphin Nautilus robotic pool cleaner is one of the best cleaners on the market is due to its filters. This unit comes with two types of filters which make it possible to remove both small and large debris. The pleated polyester filters are designed to eliminate fine debris such as dust. On the other hand, the more coarse mesh screen allows the user to remove large debris such as leaves. When it comes to cleaning devices, it is well-known that their efficiency depends on their filters. The more clogged the filters are the lesser the cleaning efficiency is. Luckily, the filters that come with Dolphin Nautilus Plus are placed on the top so they could be easily accessed. Cleaning the unit is not difficult at all. All you have to do is open the filter locking mechanism, remove the filters, and clean them with a hose. Just like all filters, these will also wear out after being used for some time. Therefore, it is suggested to change worn out filters regularly so that your Dolphin Nautilus pool cleaner could work efficiently. As already mentioned, using the Dolphin Nautilus robotic pool cleaner is very easy since the unit does all the work by itself. However, one thing the user has to take care of are the cables. Luckily, the cables of this unit are tangle-free, making it easy for the device to maneuver while cleaning. Therefore, the owner of this pool cleaner won’t have to deal with uncleaned areas resulting from cable tangling. The manufacturer also offers an electric caddy which is sold separately. The caddy makes it easier to move the entire unit around your pool. In addition, it provides an adequate space for storing the device as well as the coiled swivel cable. Cleans all the dirt and debris thoroughly. It can be used to maintain pools that are up to 50 feet long. Does not produce much noise when operating. It is very simple to setup and use the device. This pool cleaner can also clean walls and other irregular surfaces. The unit cannot clean the pool steps. It is relatively bulky, even though it weighs only 19 pounds. Sometimes, large debris might cause problems while cleaning is in progress. What is the typical lifespan of a Dolphin robotic cleaner? Every Dolphin Nautilus robotic pool cleaner is designed to last for years. However, the lifespan differs from unit to unit. In addition, many factors affect the lifespan of the units, including the amount of use, pool surface, and chemicals the unit is exposed to. Does the cleaner come with a warranty? Yes, this unit comes with a 2-year limited warranty. Can you turn off the unit before the cleaning cycle is over? Yes, you can. All you have to do is press the off button at the power supply. What is the ideal operating temperature for a Dolphin pool cleaner? Dolphin robotic pool cleaners should be used in temperatures between 43 and 93 degrees. 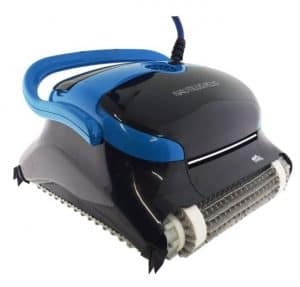 If you have never owned a robotic pool cleaner before, then you might be wondering whether it is worth investing in Dolphin Nautilus Plus. This product is great for all those who do not mind paying a slightly higher price. The product comes with many advanced features that make pool cleaning easier than ever. You will definitely love the fact that you can relax by the poolside while your robotic cleaner does all the work. In addition, thanks to its silent operation, you might even take a nap! The device does an excellent job at cleaning and scrubbing pool surfaces. Once it completes its cycle, all you will have to do is dive straight in and enjoy. This pool cleaner not the one for you? We recommend checking out our reviews for the Solar Breeze NX2 Solar powered pool skimmer or the Dolphin Triton Plus.